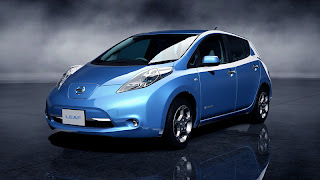 Nissan Motor Co., Ltd. today announced the release in Japan of the updated Nissan LEAF, which has received a number of enhancements. The all-electric LEAF is in its second iteration and is now available at Nissan dealers nationwide. The Nissan LEAF is the number one selling EV in the world. Since its debut in December 2010, more than 43,000 drivers around the world have chosen the LEAF. By purchasing one, owners are making a personal contribution to help create a sustainable zero-emission society; the LEAF emits zero CO2 or exhaust during operation. The new LEAF continues to offer excellent performance and driving feel, with smooth, strong acceleration and quiet delivery across a speed range that's comparable to that of luxury models, as well as great handling stability realized by well-balanced weight distribution. The affordable S grade has been added for the new model year and joins the ongoing G and X grades. There is no performance sacrifice with the new S grade. Nissan LEAF has been developed in line with Nissan's commitment to using recycled materials where possible to minimize environmental impacts. In addition, the amount of the rare earth element dysprosium used in the newly designed motor of the updated Nissan LEAF has been reduced by about 40 percent compared to the previous model—without sacrificing performance. All Nissan LEAF grades qualify for the Japanese government's eco-car subsidies and are exempt from the automobile weight tax and automobile acquisition tax. In addition, LEAF customers can receive up to 780,000 yen in incentive grants in accordance with the Japanese government's incentive scheme for fiscal year 2012 to promote the purchase of clean energy vehicles. Customers can apply for these subsidies at the Next Generation Vehicle Promotion Center. Additional subsidies may be available through local governments. To qualify for these subsidies, owners must retain the vehicle for six years. Nissan LEAF also qualifies for preferential tax incentives available for environmentally friendly vehicles. As such, the LEAF is fully exempt from the automobile acquisition tax on vehicles registered by March 31, 2015, and the automobile weight tax on vehicles registered by April 30, 2015. Additionally, the automobile tax on vehicles registered by March 31, 2014 is reduced by 50 percent for one year starting from the next fiscal year following the registrations. Plasma Cluster is a registered trademark of the Sharp Corporation.